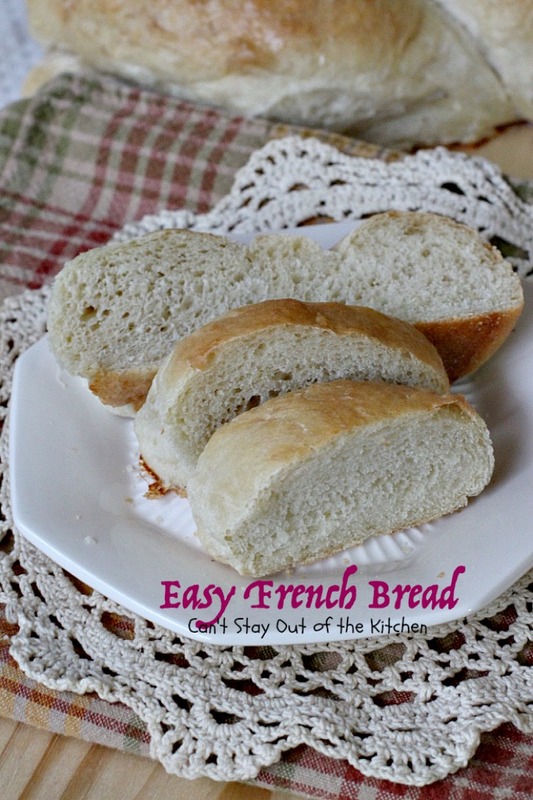 Easy French Bread is the most delicious and easiest French bread you will ever make. And I mean it really is easy. The dough rises twice in the oven at a very low temperature (the oven is turned off after reaching 100-200 degrees). I made this recipe by hand kneading and stirring, but you can also use the dough hook on your mixer/food processor. It’s also very economical. 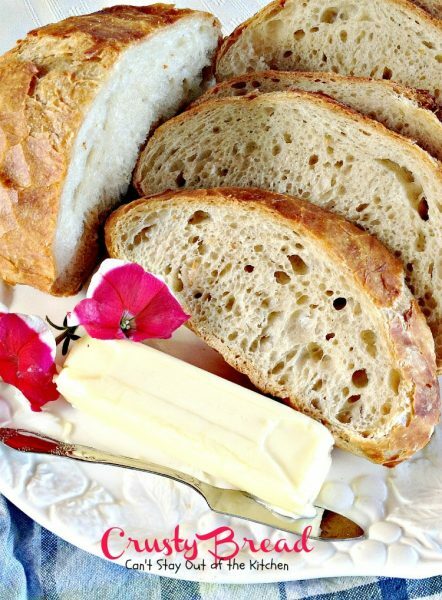 Although it takes a few hours to actually have the bread baked it isn’t labor intensive in any regard so you can have a wonderful homemade bread for dinner starting in late afternoon. I got this recipe from my friend, Megyn Cody, who makes it for potlucks all the time. I know that anything she makes is going to be excellent, and this bread is no exception. It is an incredibly satisfying comfort food. On occasion, she also splits the French bread in half, butters it and sprinkles garlic salt (and sometimes parsley) on it for her version of home-made garlic bread. That is fantastic, too. I don’t know where Megyn got the recipe, but I’m pretty sure she did not create it herself. I am grateful for her sharing the recipe with me so I could add it to my recipe collection. 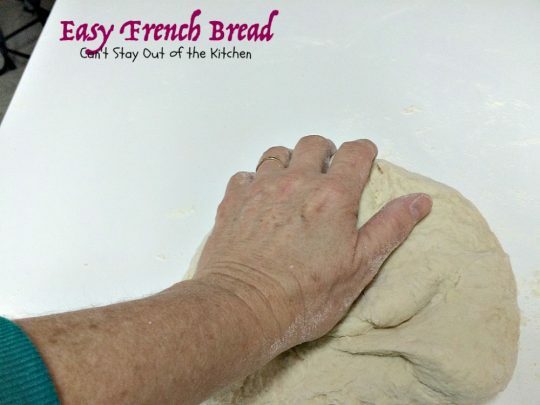 If you’re looking for a really Easy French Bread recipe, than look no farther than this one. And, the taste is out of this world, too! If desired, you can sprinkle the tops with herbs like rosemary, thyme, parsley, marjoram, basil or dill (or any of the above combinations) after you brush the egg white wash on the bread before baking it. Another nice thing about this recipe is that it calls for no oil! So it’s lower in calories than most breads. When I initially posted this on my blog in June 2012 I had only been blogging for two weeks. I used Megyn’s original pictures which were pretty dark. Then I remade the recipe later the following year but the pictures were still taken with an iPhone instead of my good Canon camera. I’ve been going back through all those first year recipes and remaking them so I can reshoot pictures that are more appetizing as well as clear. I’ve made this recipe (November 2015) about six or seven times over the past month or so, so I decided to take a few shots as well. Some of the shots are with the bread braided, the others are with the bread just rolled out into a single roll, so you can decide which way you want to make it. I took a batch of Easy French Bread along with Mushroom Soup with Winter Vegetables and Pumpkin Chocolate Chip Muffins to some friends who had sick kids recently. The nice thing about this recipe is you can freeze it also! I froze it sliced down and it worked out wonderfully, so you don’t have to freeze it whole. I will make a couple of recommendations: make sure there’s no draft from AC vents or fans when you’re dealing with yeast. 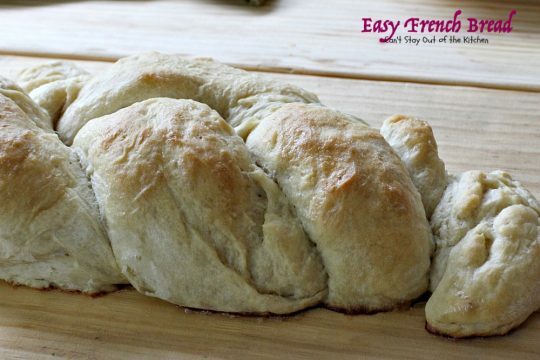 After you shape the bread and place it on a a cookie sheet, don’t cover the bread with another tea towel or when you take it off to heat up the oven, it may cause the bread to sink. I’ve taken a lot more pictures this time to show you more in depth pictures of hand-kneading. 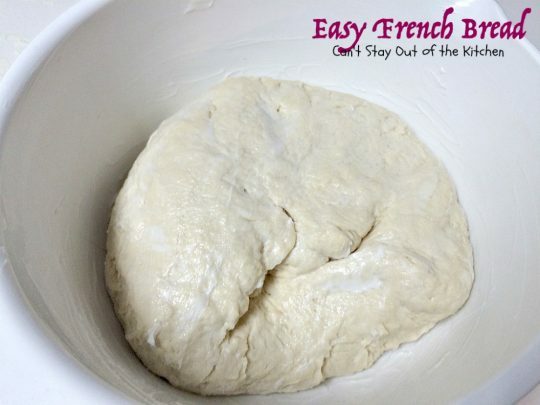 I hope you give Easy French Bread a try. It’s so tasty and easy, you’ll probably begin making it often just like I do. 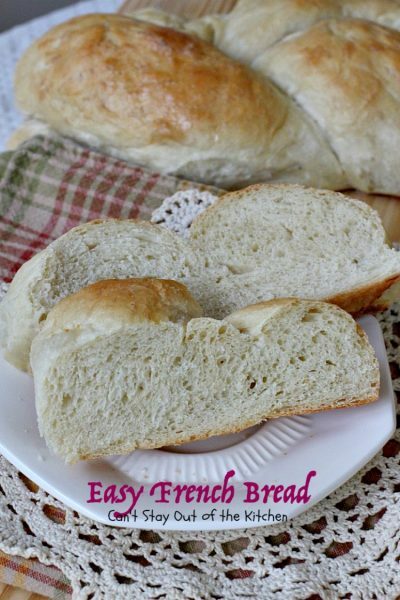 Easy French Bread is the easiest French bread recipe you will ever come across. 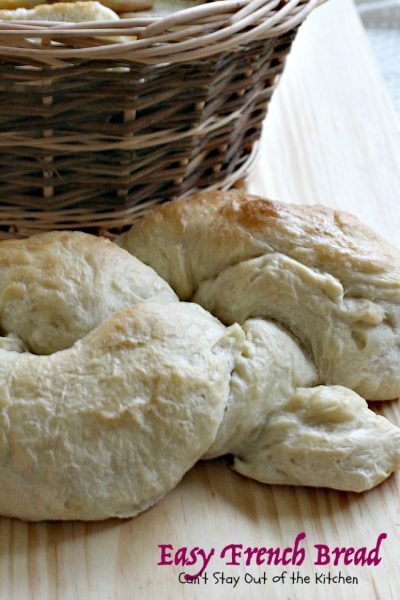 This bread turns out so lovely. It has a wonderful texture. Easy French Bread is also very economical and it tastes so much better than store bought French bread. 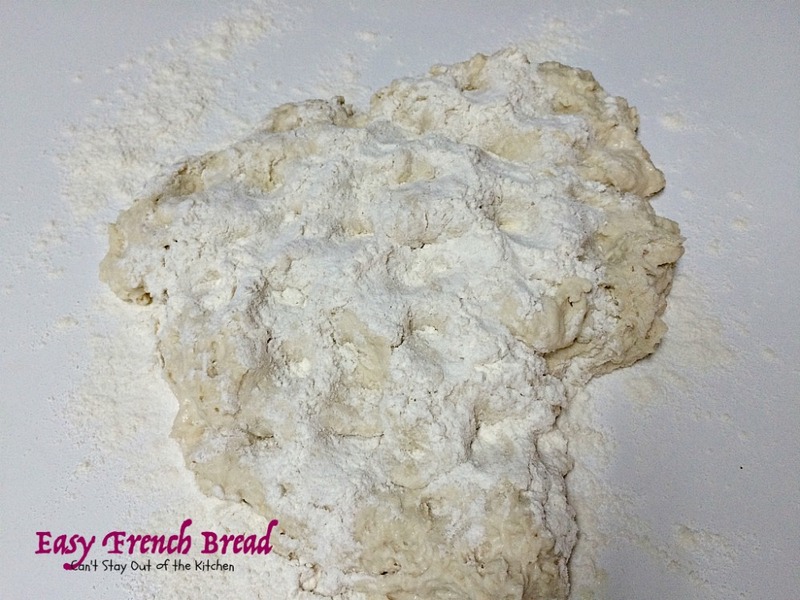 Easy French Bread has a wonderful taste without doing anything to it, but we have also used it and made garlic bread out of it. It makes the BEST garlic bread! 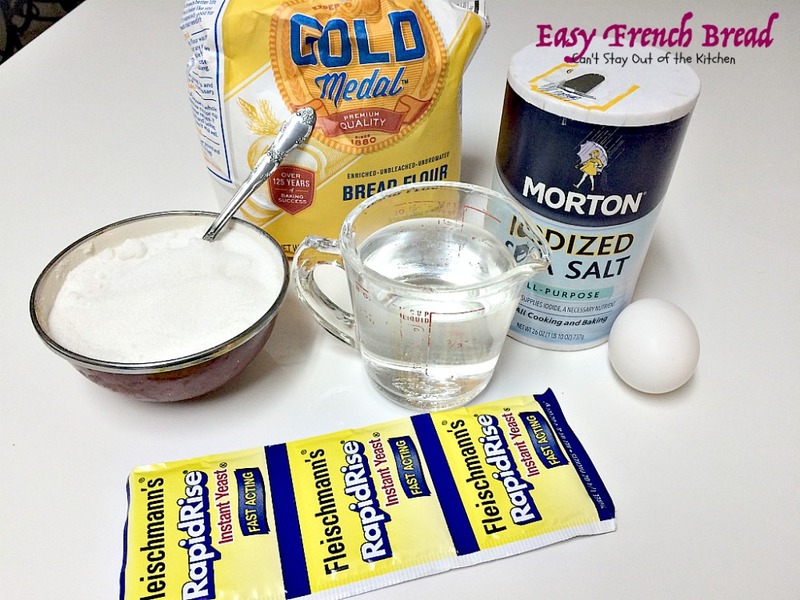 By brushing the top and sides with a mixture of egg white and water the tops turn out a beautiful golden brown. I used these 6 ingredients. Very simple. 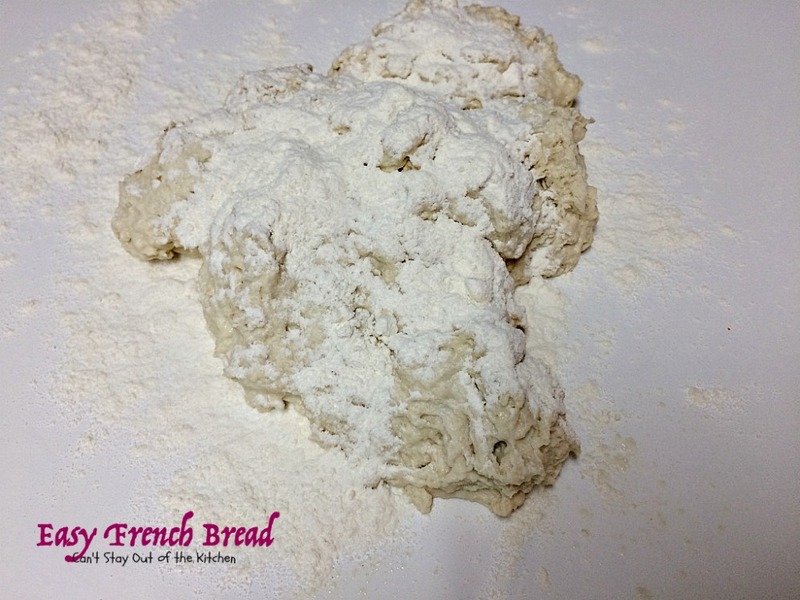 I always use bread flour when baking homemade breads. 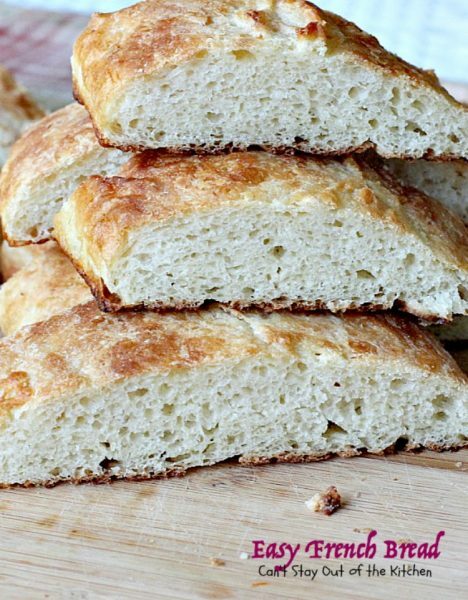 Bread flour has more gluten so the molecules of the bread adhere together better and don’t become crumbly like using all-purpose flour will. 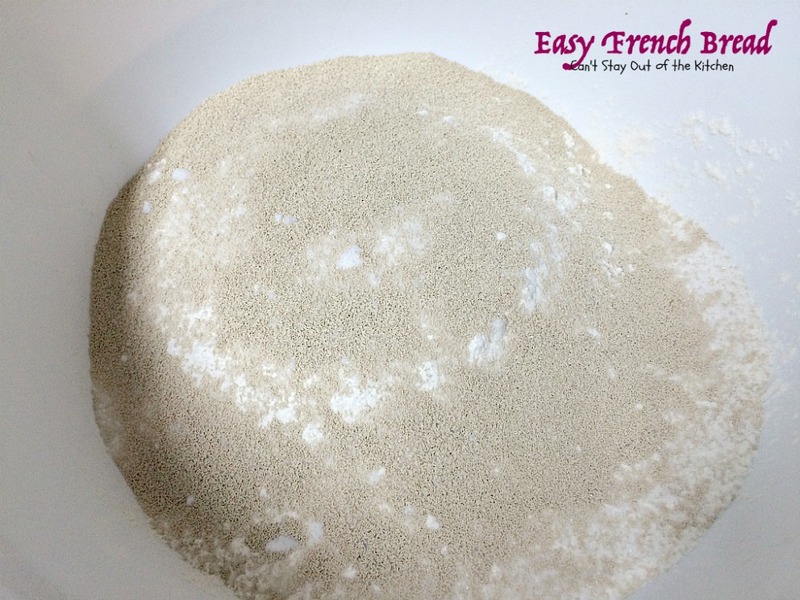 Measure the bread flour into a mixing bowl. Add salt and sugar. 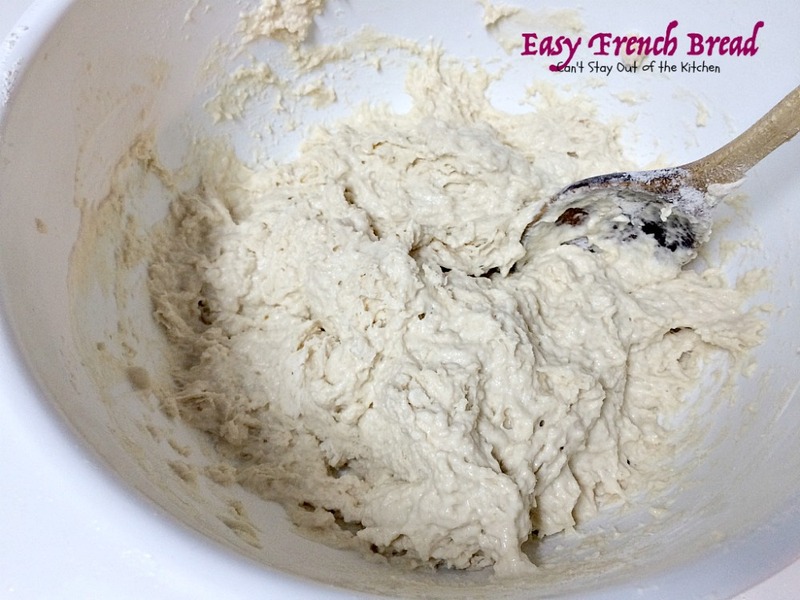 Add the yeast into the bowl. Stir ingredients to combine. Stir to combine and add the extra half cup to 3/4 cup bread flour at this time. Beat for 3 minutes with an electric mixer. I just stirred by hand for a minute or so. Sprinkle bread flour on your counter top. 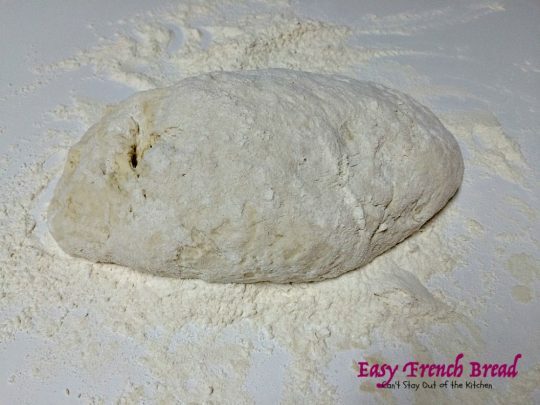 Place dough on top of the flour. Pour some more bread flour over top of the dough and work in with fingers. 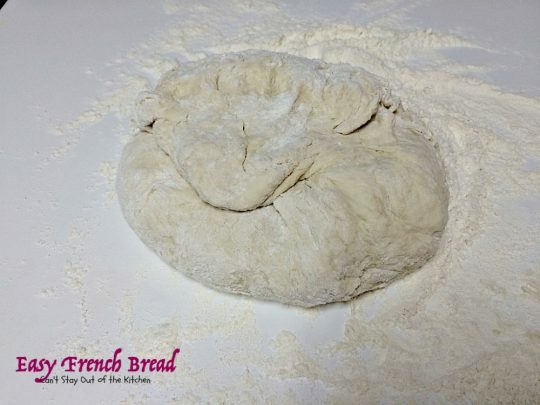 Once you get enough bread flour worked into the dough, you can knead it. That’s when it no longer sticks so badly to your fingers! 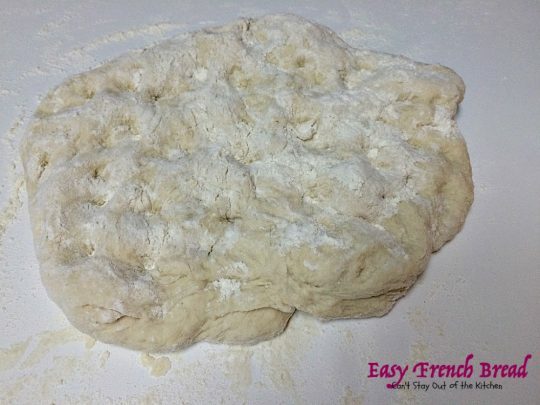 I hand kneaded it for about 5 minutes but you can use your dough hook on slowest setting for about the same amount of time. 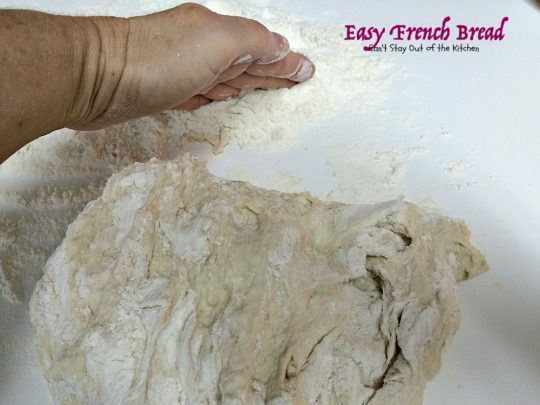 I personally prefer a hand kneaded bread because the texture comes out softer and fluffier and not as tough as a dough hook or machine kneading will do. But if you don’t have time or like getting your hands dirty, then, by all means, use the dough hook on your mixer. Here you can see I’ve poked a lot of the flour into the dough. 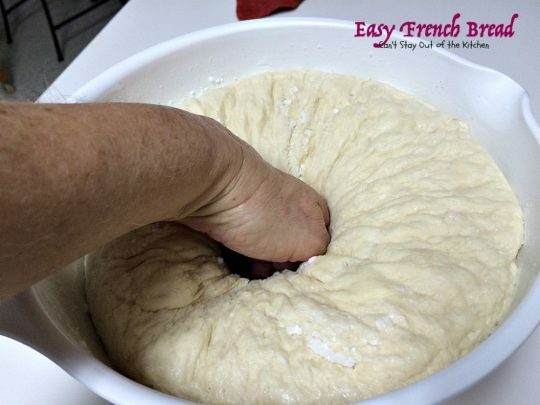 Pull the back of the dough toward you in one motion. Here you can see I’ve folded the whole of the dough over the top. With one hand push the flour into the dough with the heel of your hand. With the other hand sweep flour from the counter under the bottom of the dough. 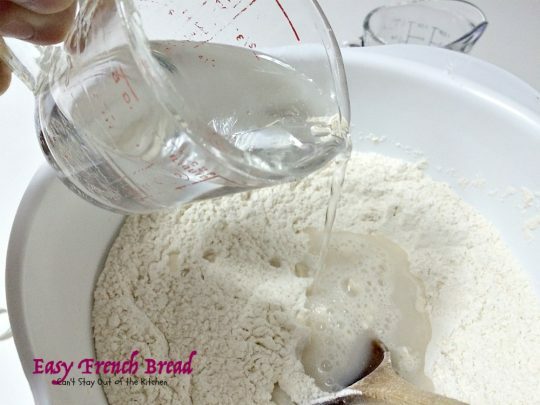 As you keep turning and working the dough and adding extra flour in this way, more and more flour gets worked into the dough. You can see that as I continue kneading the dough is becoming more plump and less sticky. Here the dough is almost done. Now I’ve spread the dough out onto the floured surface again and sprinkled a lot more flour on top. 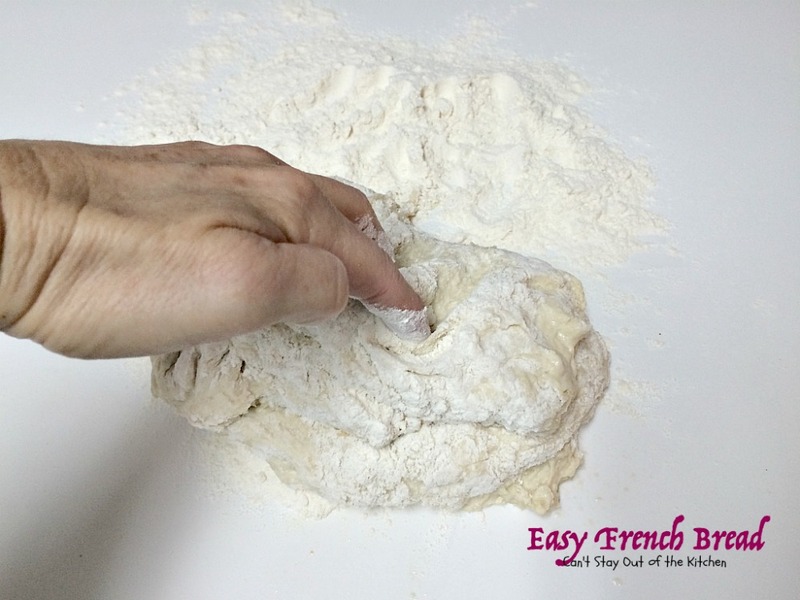 Poke the flour into the middle of the dough a second time with your fingers. I worked in that last bit of flour until the dough was no longer sticky. Grease a large mixing bowl. Add dough and grease the top. Cover with a tea towel. Place oven on 350 for exactly one minute. Turn off oven. Place dough into oven and raise until doubled–this will take about 45 minutes. Punch dough down with your fist. 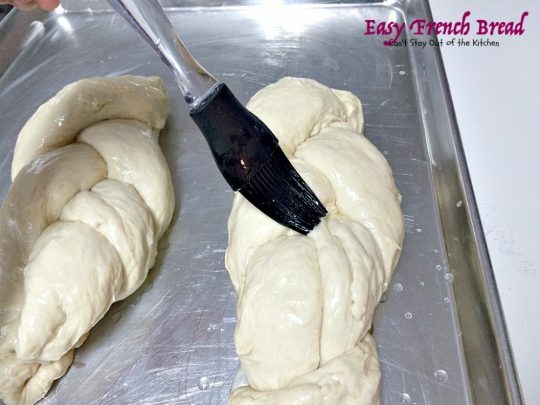 Shape dough into rectangles, or braid or whatever shape you wish to bake them. Generously grease a cookie sheet and place dough on cookie sheet. Braid as desired or roll out into a roll. Mix egg white and water. Brush on top of dough. Turn oven on 350 for exactly one minute. Turn off oven. Place cookie sheet with bread dough in oven. In about 30 minutes the bread will raise sufficiently for baking. 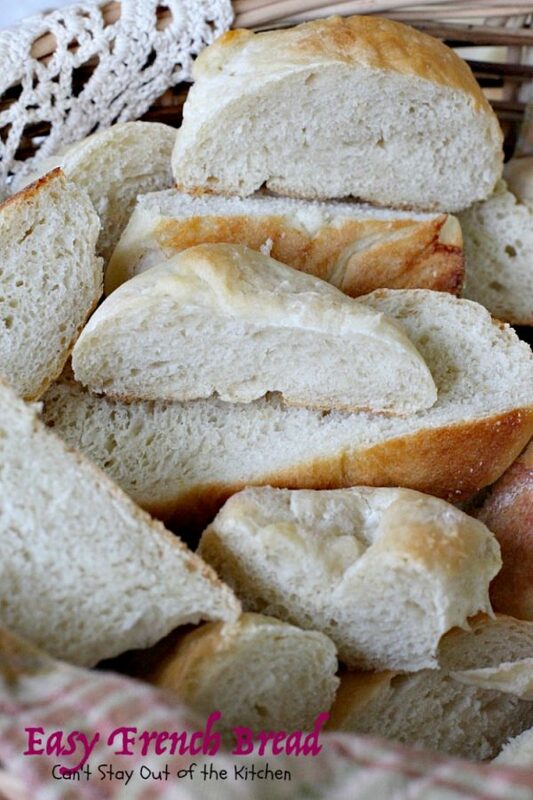 Without removing bread, turn oven on to 400 degrees to preheat oven. Bake at 400 for 10-15 minutes or until golden brown. Here’s the loaf freshly out of the oven. You can brush the top and sides with butter if you wish. That will prevent the crust from getting too hard. Slice bread down to serve. Easy French Bread is a wonderful dinner bread to serve with soup, pasta or any main dish meal. Here are a couple of pieces so you can see the texture of Easy French Bread. 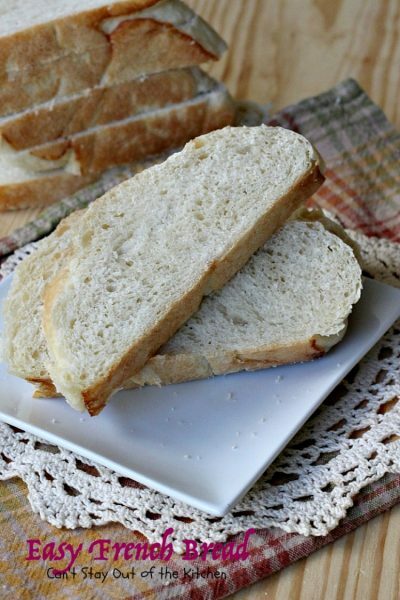 One loaf yields about 12 large slices — enough for company too, unless you have a really large family! I cut this bread with a serrated knife rather than my usual electric knife. It sliced down perfectly with barely a crumb scattered anywhere! 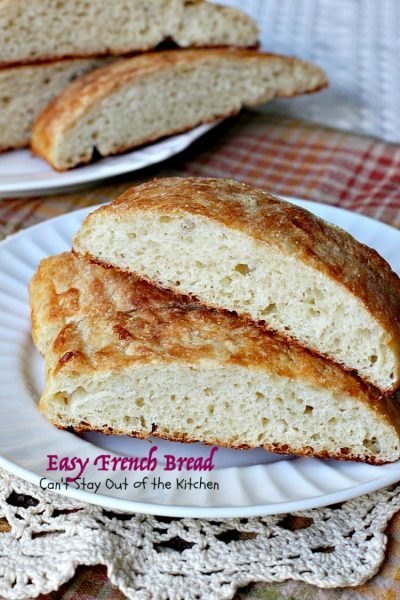 This is one of the tastiest and easiest French bread recipes you will ever find. This is great to serve as a side for soups or salads. Combine 2 cups flour with salt, sugar, and yeast. Add water and beat 3 minutes with a dough hook or 1 minutes by hand. Beat in enough flour to make a soft but kneadable dough. Place in a greased bowl. Cover with a tea towel, let rise 45 minutes. 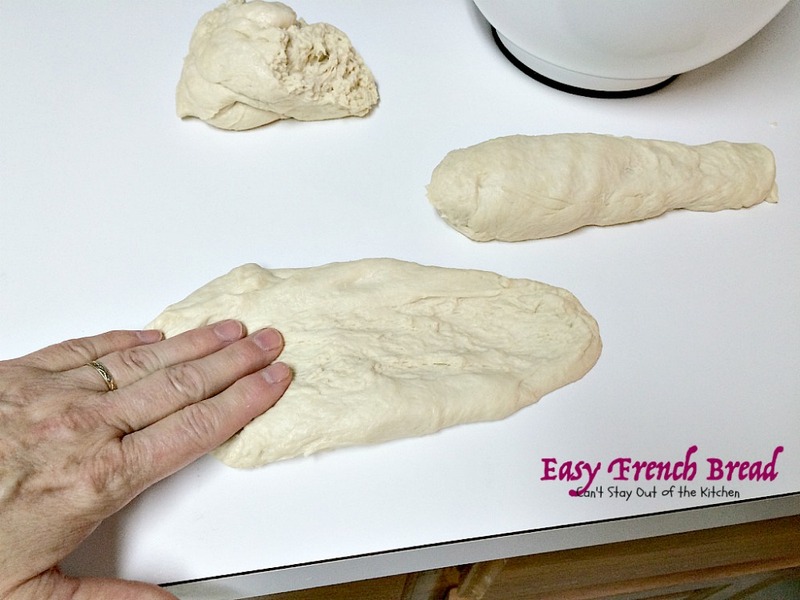 Punch dough down and roll into a rectangle, or three smaller log shapes to braid. Roll up or braid dough from long end. Place on GREASED cookie sheet. Whisk together 1 egg white and 1 tbsp. water. Brush on top of loaf. About 5 minutes before rising time ends, place bread in oven and preheat oven to 400°. Brush top crust with melted butter or oil after removing from oven. NOTE: All-purpose flour is not recommended for this recipe. NOTE: Preparation time does not include time required to raise the dough twice. MEGYN'S NOTE: The rise time is never as long as the recipe says, especially the second time. I let it rise (2nd time) about as long as it takes to preheat my oven. I use my Kitchen Aid to knead, with the dough hook on the lowest speed. In order to get the dough to rise, I preheat the oven to 350° for exactly one minute, then turn it off. Then I put the bowl, covered with a tea towel that I have gotten wet with hot water, in the oven and I leave the oven light on. My oven gets all steamy and it rises in no time. If I let the egg white mixture drip down on the cookie sheet, it makes the loaf stick really badly no matter how well I greased it. Sometimes I roll it, sometimes I braid it, and I don’t really ever roll it out first like it says. I just stretch and shape it with my hands. MY NOTE: I had a LOT of egg white drip down onto the pan and didn't have any problem at all with the bread sticking. It could be the surface of the pans that make the difference. I used a heavy duty restaurant supply type 1/4 baking sheet pan. 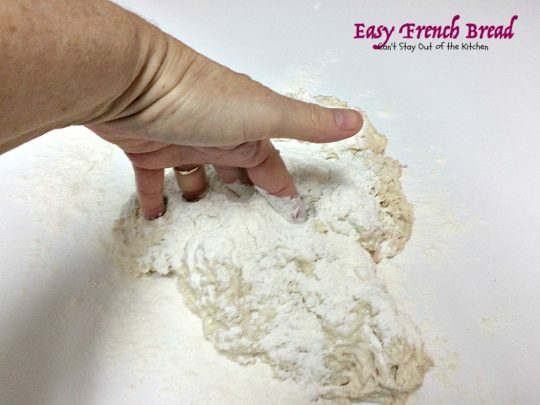 NOTE: These directions are for using your mixer to knead the dough. 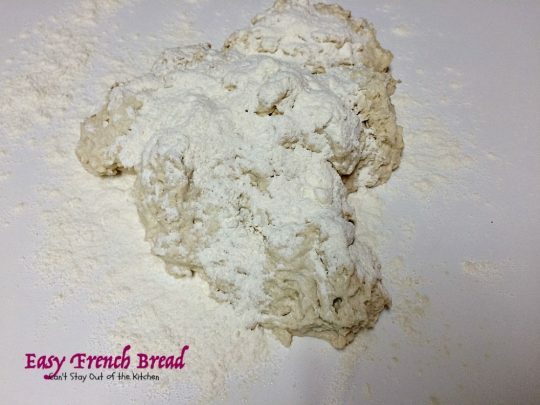 I hand knead the dough working in flour until the dough is no longer sticky—no matter how long that takes. I also only beat the mixture until it is well combined. It usually does not take 3 minutes. NOTE: I have tried other yeasts and they always seemed to die when I tried to spread the egg wash over the bread. Fleishmann's is the only yeast that doesn't do this. 1 pkg. [url href=”http://www.breadworld.com/” target=”_blank”]Fleishmann’s[/url] active dry yeast, or 2 ¼ tsp. All-purpose flour is not recommended for this recipe. [br][br]Preparation time does not include time required to raise the dough twice. [br][br][b]MEGYN’S NOTE:[/b] The rise time is never as long as the recipe says, especially the second time. I let it rise (2nd time) about as long as it takes to preheat my oven. I use my Kitchen Aid to knead, with the dough hook on the lowest speed. In order to get the dough to rise, I preheat the oven to 350° for exactly one minute, then turn it off. Then I put the bowl, covered with a tea towel that I have gotten wet with hot water, in the oven and I leave the oven light on. My oven gets all steamy and it rises in no time. If I let the egg white mixture drip down on the cookie sheet, it makes the loaf stick really badly no matter how well I greased it. Sometimes I roll it, sometimes I braid it, and I don’t really ever roll it out first like it says. I just stretch and shape it with my hands. [br][br][b]MY NOTE:[/b] I had a LOT of egg white drip down onto the pan and didn’t have any problem at all with the bread sticking. It could be the surface of the pans that make the difference. I used a heavy duty restaurant supply type 1/4 baking sheet pan. 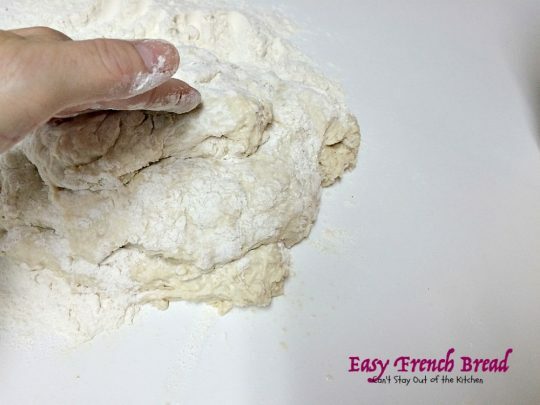 [br][br]These directions are for using your mixer to knead the dough. 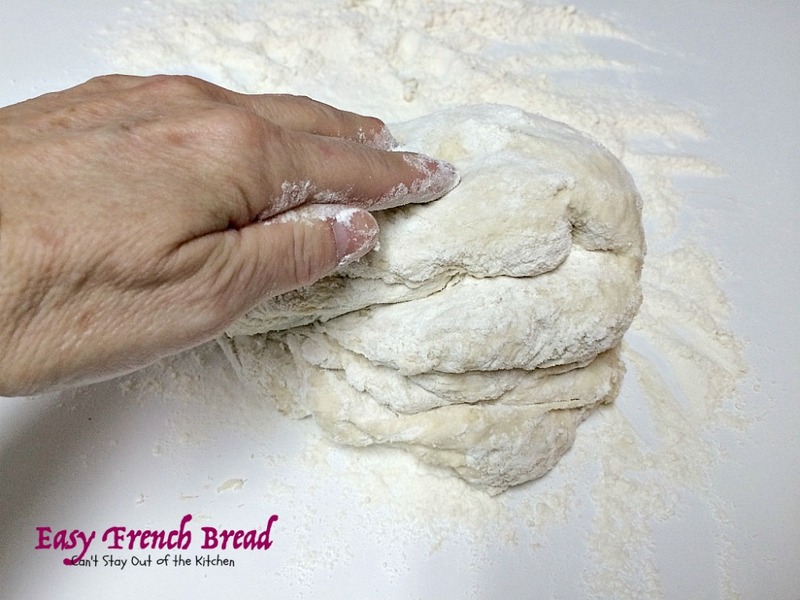 I hand knead the dough until working in flour until the dough is no longer sticky—no matter how long that takes. I also only beat the mixture until it is well combined. It usually does not take 3 minutes. Easy French Bread is great plain, buttered, or spread with butter and a honey spread! 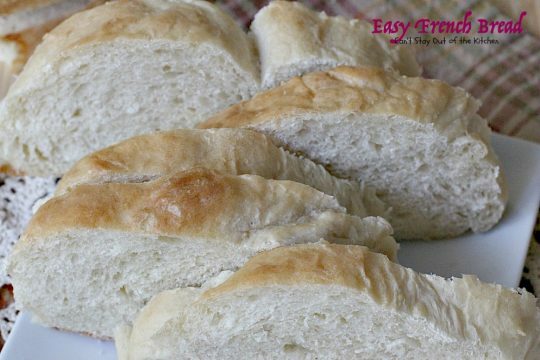 Easy French Bread is also great served with Herbed Beef Stew, La Madeleine’s Tomato-Basil Soup, Loaded Baked Potato Soup, or Canadian Cheese Soup. Doesn’t Easy French Bread look delicious? It tastes even better than it looks! We have eaten this bread many times at Megyn’s house. It never disappoints but comes out perfectly every time. 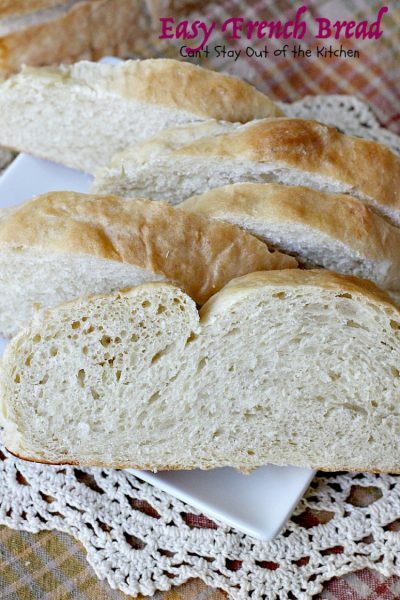 This is a great bread to serve if you’re making an Italian dinner like Baked Manicotti, My Favorite Lasagna, Tortellini Spinach Casserole, Stuffed Shells Florentine, or Supreme Pizza Casserole. Best bread I ever had! No kidding . I followed all the directions and notes and I had delicious bread homemade . Thank you so much! I’m so glad, Lissette. It’s also good to slice it in half lengthwise, add butter and garlic salt (even a little dried parsley) and bake it a few minutes in the oven for garlic bread. We love this bread.